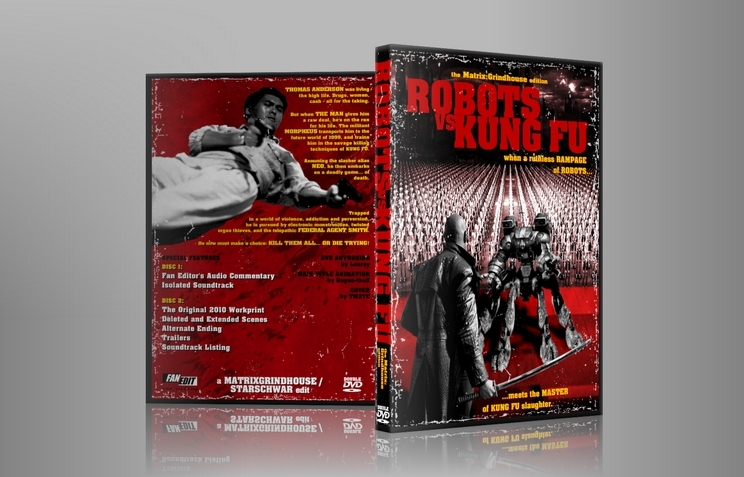 When a ruthless rampage of robots meets the master of Kung Fu slaughter! Thomas Anderson was living the high life. Drugs, women, cash - all for the taking. But when The Man gives him a raw deal, he's on the run for his life. The militant Morpheus transports him to the future world of 1999, and trains him in the savage killing techniques of Kung Fu. Assuming the slasher alias Neo, he then embarks on a deadly game... of death. Trapped in a world of violence, addiction, and perversion, he is pursued by electronic monstrosities, twisted organ thieves, and the telepathic Federal Agent Smith. Now he must make a choice: kill them all... or die trying! I sought out to completely alter the movie as we know it. The presentation is now that of a mid-1980s exploitation film. The famous green tint has been removed and replaced with thick grain and print damage. The plot, character motivations, personalities, and sequence of events have been changed to tell the story in a new manner. Wherever possible, characters are made to be worse people. Everything depicted is - wherever possible - changed to be cheaper (via extensive use of behind-the-scenes footage), sleazier, darker, or simply different from the original version. The soundtrack has been almost completely replaced in favor of new music, with the emphasis on 70's synth to better suit the style and supposed time period. Continuity errors have been created where none had existed. New subplots have been added. Dialogue has been altered. I have changed everything that I possibly can change, while keeping within the context of the purpose of this project. Whenever possible, I tried to make the movie "worse", or just plain different. With a stockpile of behind the scenes footage, and obscure Matrix-related media (such as dialogue audio files from the defenct MMORPG), I had plenty of material to work with. I fell in love with this edit from the moment I saw the trailer. The humour is 100% on-point and the tone treads the perfect line between ridiculous and sublime. The editing is absolutely first-rate, including the hilarious continuity errors and use of behind-the-scenes footage where wires and other stage apparatus can be clearly seen. In an age where you can sit down and watch a Hollywood 'comedy' and not laugh once in 90 minutes of torture, this edit will make you laugh out loud at regular intervals. Perhaps most impressive is the way in which the editor ambitiously and successfully tells a very different story to the original, one in which everyone is basically an ***hole, Neo a false prophet who plays both sides and Smith a tapdancing sexual deviant. The soundtrack is inspired, it brings everything together with such a glorious 80's vibe. I (conceitedly) consider myself to be quite knowledgeable about music in general, so I was amazed, but not at all sorry to be introduced to 'Space' for the very first time. It's like this music was created specifically for this grindhouse edit, so perfectly does it fit the tone and style. I'm currently up to my third watch in the space of barely more than a week, and I know that total will number in the tens before the end of the year. I literally love everything about this edit and I cannot recommend that people watch it enough! I loved the "cheap" feel of the footage, the use of behind the scenes was great! Seeing the wires and missed punches/kicks was genius. Overall i felt like it was a solid edit, and really felt like a shoestring budget version of the matrix. 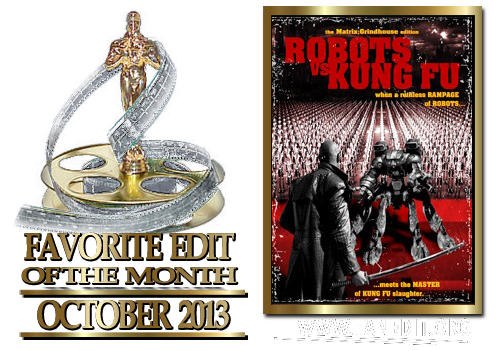 The only thing i really didn't like and why i gave the narrative a lower score was the fact i don't really think the Johnny Mnemonic scenes worked very well, it through the story flow off, and i had a little trouble understanding what was happening. This was pure awesomeness. The tone was maintained throughout, so if you love the first five or ten minutes the whole thing will be in your wheelhouse. I laughed out loud and karate kicked the air multiple times. Great execution! The whole modern grindhouse genre is a very fascinating idea but not one that I think works well in a long form format. Hobo with a Shotgun, Machete, and Planet Terror, to name a few, were all novel ideas but after the initial awe wore off I began to become disinterested. This is the same thing that happened with this edit. I found the idea extremely interesting and unique but half way into it, I lost interest and began to drift away from paying attention. This has nothing to do with the quality of the edit but is more a reflection on my interest and thoughts on the genre. 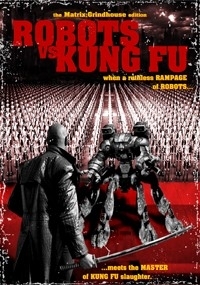 Rating the technical aspect of a film like this is difficult because bad editing techniques are what make a film a grindhouse film. That being said, this edit is a perfect representation of how the techniques for a grindhouse film should be executed. The amount of work that must have went into this edit is astounding. I don't really think the Johnny Mnemonic scenes worked very well for the most part because they threw off the narrative, which is why I gave it an 8 rating. On the other hand, there were several things about this edit that I did enjoy. The running gag of Agent Smith zipping his pants (inferring a certain action) was hilarious. As were some of the lines of dialogue, like the conversation between Neo and Trinity about her being a man a long time ago HAHA!! I also really enjoyed the ending, which I won't spoil. My favorite part of this edit was actually the fake trailers that occur before the feature film, similar to the fake trailers before Grindhouse (Planet Terror/Death Proof). Trailers of this sort is where I feel the modern grindhouse technique is best used, because they are in a short form format. Overall, even though I didn't enjoy this edit as much as others I would still recommend it. The ideas are solid and would be hard pressed to find anything as original. For those reasons alone, this edit should be viewed and if another is released I will most certainly view that as well. The great thing about the grindhouse genre of fanedits is that every flaw and imperfection actually makes it better! I was, and am, a huge fan of Mystery Science Theater 3000, particularly the early Joel episodes, but all of it. And then onto Cinematic Titanic and Rifftrax (and Wrecking Crew) and on and on. So in loving that show there is a certain appreciation one gains for this kind of film-making. I loved that the subplot with that guy named "Raulph?" that Neo kept calling only kinda made sense. (I think the scenes were from Johnny Mnemonic, but I haven't seen that movie). I loved that horrible background music drowned out quite a lot of the dialogue! I loved that you could almost always see the wires during fight scenes! The training sequence between Morpheus and Neo was loooooong. It made me think of an old MST3K movie featuring a lot of rock climbing. I loved how almost none of Neo's inserted dialogue really flowed or worked at all!! It becomes hysterical at times. It is absolutely fantastic! I really REALLY loved the ending!!! I laughed for five or ten minutes at it's abruptness, despite the preceding summary/montage. This was brilliant and I hope there is a sequel, as the Coming Attractions promised!